Just two weeks after it confirmed that the models were to be produced, Mercedes-AMG has released full specs of the all-new GT and GT C Roadsters. During its media evening at the Paris Motor Show, the German carmaker unveiled the stylish convertible models along with a host of technical information. However, no mention of pricing was made. The two variants, while sharing the same AMG DNA, are distinctly different. 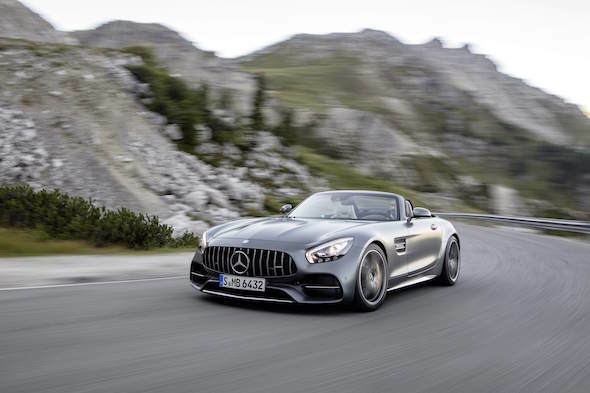 The entry-level AMG GT Roadster will produce 476hp and 630Nm of peak torque, and will be able to accelerate from 0-62mph in four seconds before topping out at 188mph. Its 4.0-litre V8 powertrain with twin turbochargers and direct injection will do 30.1mpg, with combined CO2 emissions of 219g/km. Meanwhile, the far more potent AMG GT C will boast the same powertrain, but will produce 557hp and 680Nm at peak torque. Reaching 62mph from a standstill in just 3.7 seconds, and with a top speed of 196mph, as would be expected it is not quite as economical as its standard sibling. A combined fuel consumption of 24.8mpg is seen, while it produces 259g/km of CO2. Both models feature styling cues from the AMG GT R sports car, such as the wide rear wings. These create space for a wider track and wider wheels at the rear axle, which allow for high cornering speeds and excellent traction. However, the AMG GT C also features the model's revered technical refinements, including active rear axle steering and the electronically controlled rear axle locking differential. AMG Ride Control sport suspension also features on the sportier roadster, while the lower-spec model uses AMG sport suspension. Tobias Moers, Chairman of Mercedes-AMG, said: "With our two Roadster models, we are strategically expanding the AMG GT family by two exciting variants. "With the AMG GT C Roadster, we are also introducing a new model variant to which we have transferred main performance-related components from our top sports car, the AMG GT R. The result: a highly dynamic driving experience in a very exclusive ambience, coupled with that pure roadster feeling."